Add cumin powder, sugar and salt, beat until smooth. Add chopped green chilli and chopped fresh pineapple pieces, mix well. Transfer it to individual serving bowls and garnish with chopped coriander leaves and pomegranate seeds; serve. Avoid sugar if you do not like sweet taste. You can use the canned pineapple. However, use less amount of sugar as pineapple pieces are already dipped in sugar syrup. Serving Ideas: It can be served as an accompaniment with your favorite meal. 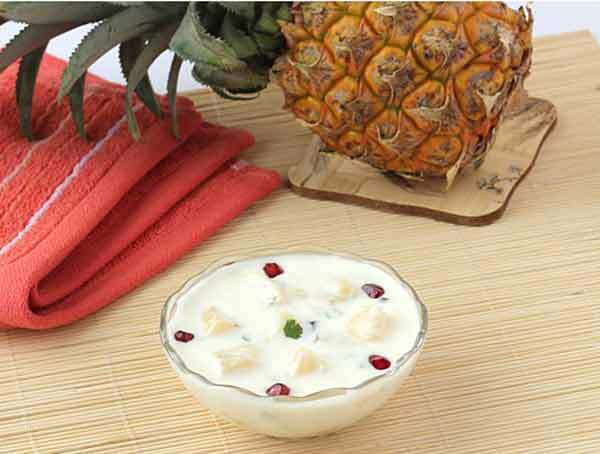 Serve it with any spicy rice dish like biryani or vegetable pulao or as a dessert, according to Foodviva.com.